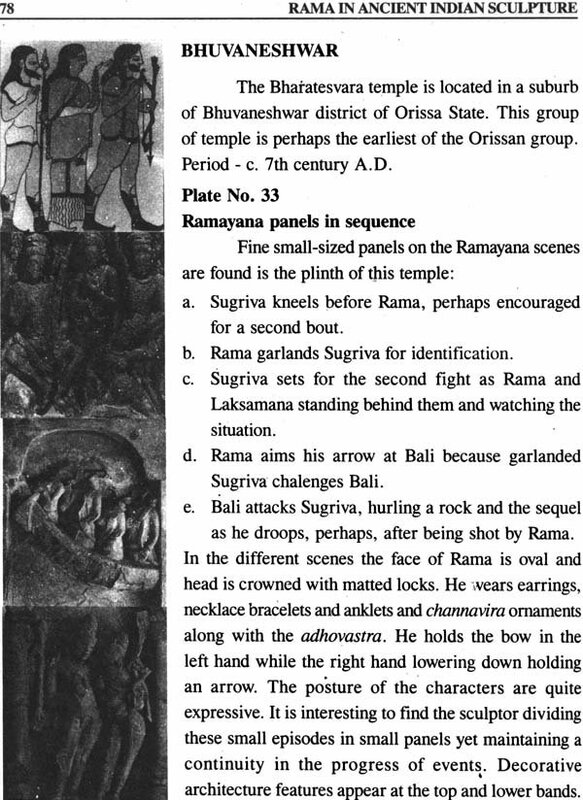 The Ramayana, composed by the saga Valmiki, is popular throughout the world. Rama, the incarnation of Vishnu and Lord of Hindu mind has been depicted in several art from. 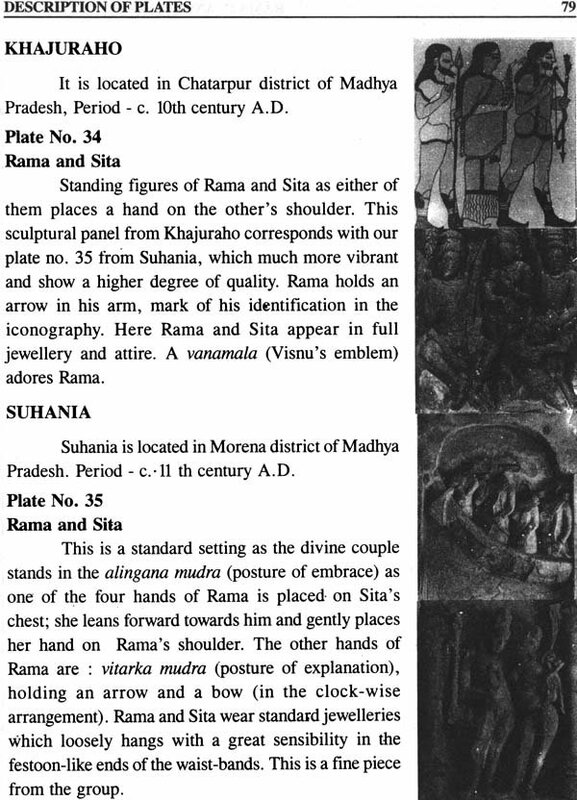 Among them the ancient Indian sculptor made their best effort to portray Rama in accordance with the requirement of episode. 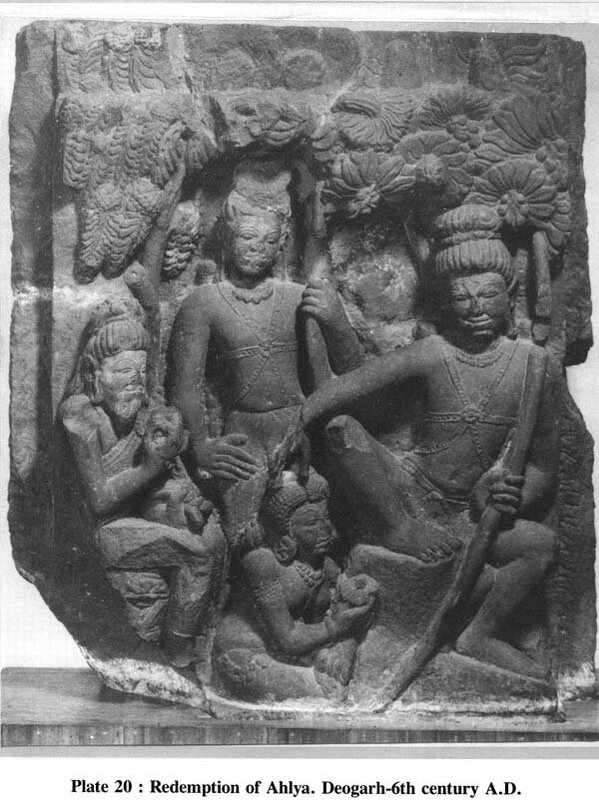 “Rama in Ancient Indian Sculpture” is an effort to discuss and explain the chronological development of Ramayana sculpture especially the sculpture of Rama and its iconographic characteristics in Indian art throughout the country. The development of Rama’s sculpture revels that narrative description and expression of episodes in sculpture concluded in the form of tribhanga statue meant for the imagination and worship of almighty power, the Lord Rama. Anand Prakash Gaur student of Indology, serving the department, Govt. of U.P as Registering officer, Antiquities and Art Treasure, (An act of Govt. of India) and presently posted at Faizabad. During his carrier he got an opportunity to develop Ramkatha Museum and Ayodhya Shodh sansthan (Units of Departments of Culture) at Ayodhya in various academic ways. During his different postings he made wide survey antiquities including Ramkatha Sculpture, manuscripts, Painting and literature etc. He has an aptitude to conduct and supervise the research work for the last several years and he engages himself in studies about the different aspects of Ramkatha studies. The present monograph is resultant of his aptitude. The story of Rama has great impact on Hindu mind, to the extent that the people have adopted his divine qualities as an ideal in their life and practice, which reflects our devotion towards Him. Rama has been an embodiment of Indian traditions and culture and unimpaired voluminous literature. 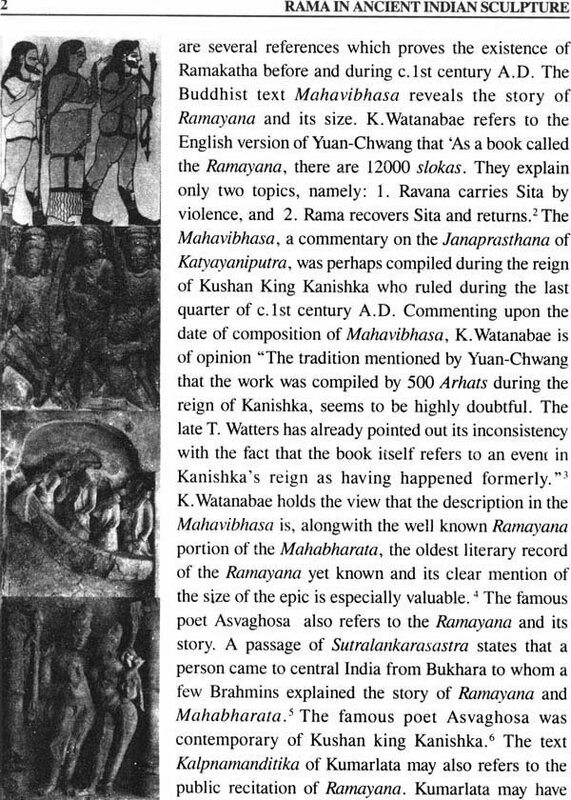 To begin with Valmiki’s Ramayana the story of Rama travelled far and wide in the country with a number of overtones and yet Rama was and shall be the greatest symbol of righteousness to an Indian mind. For the last several years the attention of the scholars have been drawn towards the Ramayana and its depiction in various art forms like paintings, sculptures, dance, music & drama etc. 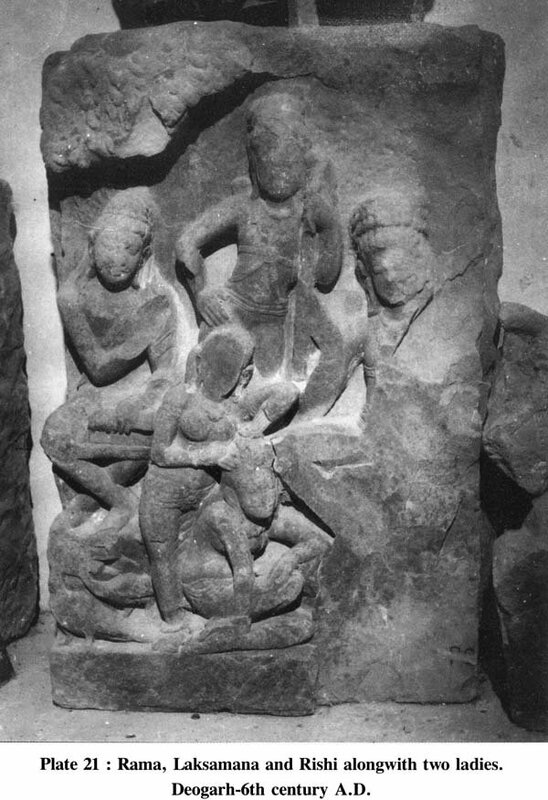 Among the different type of artists, especially the sculptures had been depicted the Ramayana episodes in terracotta, stone etc. on the walls and slabs of different the people about divine deeds, personality, characteristic and attributes of lord Rama. This indicates the devotional feeling of the Indian minds towards their Almighty and Restorer i.e. Rama. 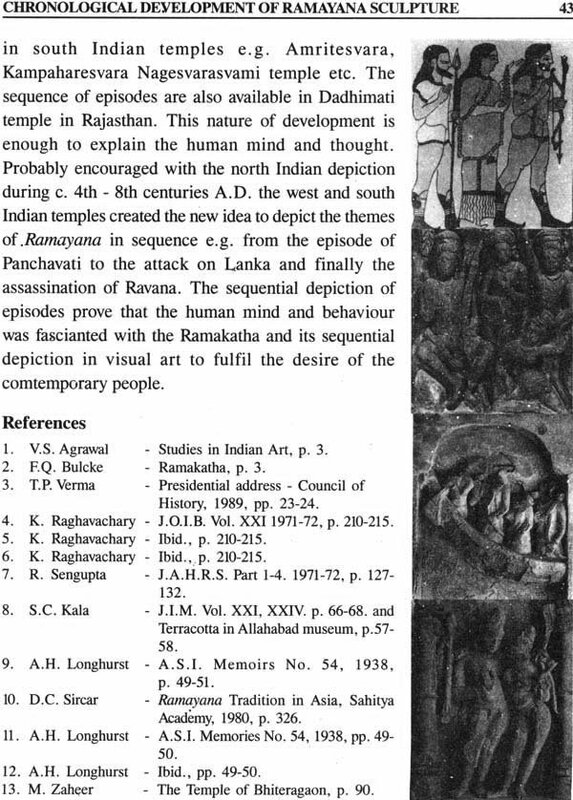 The chronological development of Ramayana sculptures which is now available reveals that starting from the terracotta passed through the narrative expressions on the walls and slabs of the temples, the independent image of the bronzes, stones etc. have emerged. The tribhanga variety of image is meant for the devotional worship and imagination of Almighty Power with personification of Epic Rama in the form of Supreme Being. 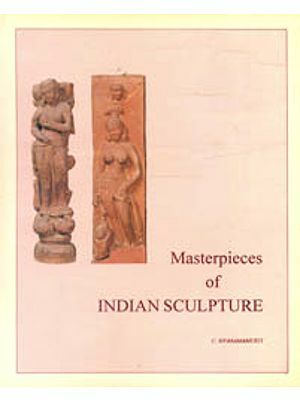 The ancient Indian sculptors inherited rich traditions of the Ramayana themes and there was always a necessity to have in one cover, progression of Rama story depicted in stone and terracotta, those obviously part of religious establishment and therefore were treated were treated with great deal of sincerity involvement and reverence. 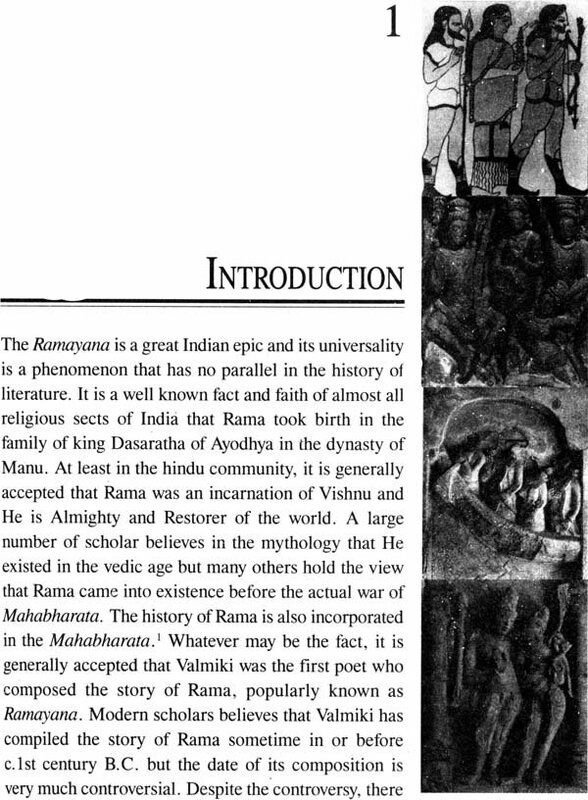 Inspired by the divine power, I dare to write about the sculptural representation of Rama and his divine deeds, its chronological developments, and iconographic attributed. The fact and reference would provide a base, and would pave the way for further researches. 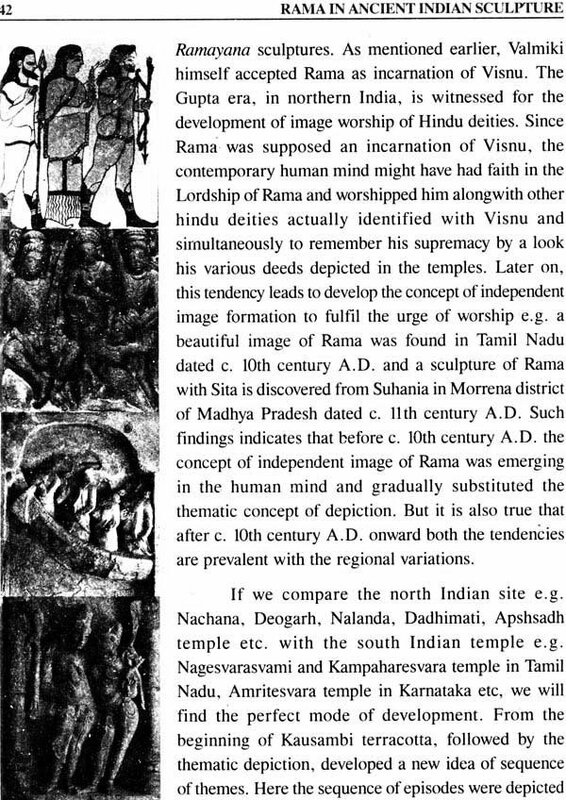 I believe that this work would also provide the answer to the long and important quest in Indian mind to know about the physical representation of Rama in India. I acknowledge with deep gratitude and respect to Professor Dr. Anand Krishna, Ex. Dean, Faculty of Arts, and former Head of the Department of History of Art, Banaras Hindu University, Varanasi, who extended his best cooperation guidance, and support. He has been kind enough to write foreword of this book. My grateful acknowledgement to Dr. Thakur Prasad Verma, Department of Ancient Indian History, culture and Archaeology, Banaras Hindu University, Varanasi, who always took interest in my efforts and assisted in various ways despite his busy schedules. I am personally obliged and grateful to Dr. Neelkanth Purshottama Joshi, Former Director, State Museum, Lucknow who took pain to check the works and gave me his sincere advice to complish the work. My sincere thanks and respect to Dr. Ram Kishore Srivastava, Ex. Principal, and Former Head of the Department, Ancient History Archaeology & Culture, K.S. Saket post Graduate College, Ayodhya, Faizabad. Who always encouraged me to accomplish the difficult task? I am highly grateful, personally obliged and acknowledging the support of Libraries, Museum & Institution who granted me the permission to publish the photographs in the book. I extend my deep gratitude, curtsy and acknowledging to all those laureates and their work on the subject, quoted and referred in the monograph. I will always remain grateful and indebted to them. I extend my respect to my parents and affection to the younger, who cooperated in various ways. The best wishes and blessings of all family members encouraged me to accomplish this monographs. I have completed this monograph about five years back, but due to unavoidable official and personal circumstance it could not be published earlier. I am highly grateful and express my sincere thanks to Mr. Praveer Mittal and Neeraj Mittal, B.R. Publishing Corporation, New Delhi, who kindly accepted to publish this monograph.